Help us to renovate our Hall!! 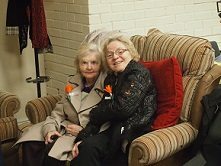 At Friends of the Elderly we are committed to improving our facilities to become more Age Friendly. With the recent completion of Phase one of our Age Friendly renovation programme our ‘Cosy Corner’ is now up and running and is a big success with our older friends. We want to create an environment that will enable older people to feel safe and secure while also feeling socially included in our community. Friends of the Elderly want our clubs to be a welcoming place for our older members , a place where they can rest, have a cup of tea and a chat, get some help with internet or on-line bill paying, enjoy live music and generally feel at home. We are now looking for help with Phase two of our renovation programme which hopes to facilitate the upgrading of our toilet and kitchen facilities and also our reception area. Making a donation online for our Hall Renovation programme or by sending a cheque to Friends of the Elderly Ireland, 25 Bolton Street, Dublin 1. Movie Club is now on Thursdays from 2-4pm!